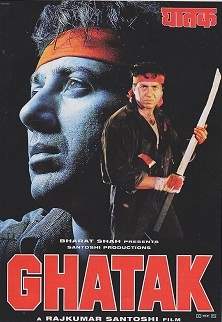 Hello Guys, I am sharing some beautiful and hard hitting Sunny Deol dialogues of Ghatak film. This film was released in 1996. This was the super hit movie on Box Office. This movie is very popular and this is the one off the best movie of Sunny Deol. The film stars Sunny Deol, Meenakshi Seshadri and Danny Denzongpa in main lead role and other Amrish puri in supporting role. The movie is is directed by Rajkumar Santoshiand produced by Rajkumar Santoshi. Sunny Deol played a very aggressive and angry role name Kashi Nath. The movie dialogues are more famous than movie. All dialogues are superb and hard hitting and mostly are delivered by Sunny Deol and Danny. "Ab saare neta log hawala ke chakkar mein hawalat ke chakkar khayengen"